The settlement of Nain, about 3 kilometres west of Greenock was created in 1854. It was a subdivision of section 127 in the Hundred of Nuriootpa and consisted of 640 acres. The owners, Johann Gottlieb Dohnt and Johann G. Steicke, created 9 blocks and named it after a town in Palestine. 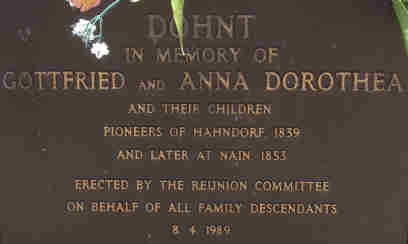 Among some of the early settlers were Gottfried and Anna Dorothea Dohnt, Christian and Gottlob Zilm, Wilhelm Schwarz, Matthias Andreas Dienhoff, Louise Bartels and her son Gottlieb, Johann Gottlieb Wilke and Johann Gottlieb Schache. As early as 1860 the community had its own resident Pastor, the Rev. Chr. Auricht. Most of the first settlers were Germans from Hahndorf. Others, among them Johann Gottlieb Mattner, born on 10 October 1867 at South Rhine, came from other earlier predominantly German settlements. There was also another Nain, adjacent to Daveyston. As early as 1857 settlers had wanted the road between the Old Nain Hotel and Mr Davey's mill metalled. A little later the Central Road Board accepted the tender of Michael Kiely for a road to be made between Nain and Greenock. Although almost all of the early settlers were Germans, and Lutherans, they were not always on the best of terms. When Louise Bartels noticed that some of her cows had wandered off she tried to take them back from Wilke's land to her own. However Wilke tried to stop her as he wanted the cattle impounded. With some forceful help of her son she was able to rescue her cows. Wilke took legal action and both Louise and her son were fined. In February 1861, when the Master and Servant Act was still enforced, Matthew Dienhoff charged Ferdinand Gollnish, one of his workers, with having on 28 January wilfully absented himself from his service, after having entered into a contract to serve him for 12 months. The case was proved and Gollnish had to suffer the consequences. In May 1877 Simon Modistach was brought before the court for beating his wife and threatening to shoot her. He was fined 5 pounds and ordered to keep the peace for six months. Two years later Thomas Hicks and John Sheehan were sentenced to a term of hard labour for robbing Frederick Peters. As late as September 1889 the Rev. 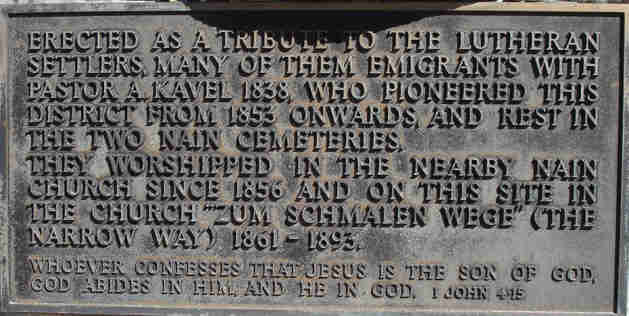 Charles Heinze, Lutheran Minister at Nain was brought before S. von Bertouch, J.P. as a pauper lunatic and committed to the Adelaide asylum. There are two cemeteries in Nain.